The Duchesne blood came to the fore early in Philippine – revealing itself in strong doses of willfulness, stubbornness and independence. This served, however, to help her resist the marriage proposals her parents arranged for her, and remain faithful to the religious vocation she knew God had given to her since the “call,” as she termed it, at age 8 on her First Communion day. 1. What happened to Philippine’s father? In 1814, he died with Philippine and her sister at his side, after receiving Confession and Extreme Unction. His conversion was a triumph of the daughter’s faith, trust and prayer, made powerful by the complete sacrifice of self. Louis Callan, RSCJ, Philippine Duchesne, Frontier Missionary of the Sacred Heart (Newman Press: 1966), pp. 128-9. We can catch a glimpse of her strong will and determination in the story of her entrance at age 18 into the Visitation Convent of St. Marie d’en Haut nearby her home. One morning she left home in the company of an aunt to visit the convent. Once there, she simply announced her intention to stay, and set her distraught aunt home alone to face her enraged father. He rushed to the convent to confront his daughter and take her home, but left resigned to the decision of Philippine, so like him in temperament. She did, however, acquiesce to her father’s wishes that she not take her final vows until she was 25 because of the political upheaval in France. Nor was it long before her father’s well-founded fears came to realization. In 1792, while Philippine was still a postulant, the nuns were dispersed by order of the Government. During the Reign of Terror, St. Marie Convent was used as prison for those who opposed the Revolution in the area. In 1801, after Napoleon Bonaparte had overthrown the revolutionary Directory, Philippine used her own funds to purchase the badly damaged Convent of St. Marie d’en Haut from the State. Several nuns joined her there, but soon left, complaining that the work was too difficult and Philippine too exacting in demanding compliance to the old Rule. It was the first of many failures for Philippine Duchesne, but she remained on the former Visitation grounds, convinced that God had a plan for her and her beloved Convent. At age 35, Philippine Duchesne signed over her Convent to the Society and became a postulant in a new community. One year later her first vows were taken, and she finally pledged herself to poverty, chastity, and obedience. The next years were busy ones for the fledgling community. Mother Barat quickly recognized the organizational qualities in the great and generous soul of Mother Duchesne, who became secretary general of the Order and was given charge of the new motherhouse in Paris. Had she remained in France, she would have enjoyed the honor of her community, the consolation of her close friendship with Mother Barat, and the company and support of her distinguished and prosperous family. Instead, what took root in her heart was a great desire to bring the Gospel to the forsaken “savages” of America. After hearing a sermon from a traveling missionary in 1805, Mother Duchesne felt irresistibly drawn to the foreign missions. For twelve years, with holy impatience, she pleaded to go, offering all her works, prayers and sacrifices for the sake of her “dark souls” in America. In January of 1817, Bishop Louis Dubourg of St. Louis, Mo. came to France to beg for sisters to be spared for the American missions. Mother Barat had neither spare funds nor sisters for the enterprise. But the indomitable Philippine intervened, for a second time throwing herself at the feet of her Superior, begging consent to go. There was a poignant moment of silence – and permission was granted. At last, in March of 1818, Mother Philippine Duchesne, age 49, was placed as superior over a band of four other missionary sisters who set sail for the New World on the vessel Rebecca. The sisters arrived in New Orleans with no instructions from Bishop Dubourg. Mother Duchesne soon came to the sore realization that they had been called to America not to work with the Indians, but to educate the daughters of merchants and farmers. Months later, when the sisters finally arrived in St. Louis (MO) they were asked to establish themselves in St. Charles, 14 miles from St. Louis on the Mississippi River, which Mother Duchesne described as “the remotest village in the United States.” In a one-room shanty on a two-acre plot without a tree or blade of grass, they established the first Convent west of the Mississippi and the first free school for girls in the United States. In her famous letter describing that first brutal winter, she reported how water froze in the pails on the way from the creek to the cabin, how food froze to the table, and how the sisters often had no fire for lack of tools to cut wood. (2) By the spring of 1819, the house in St. Charles was considered impracticable, and a new foundation with a convent, novitiate and boarding school was begun at Florissant, north of St. Louis, Mo. 2. 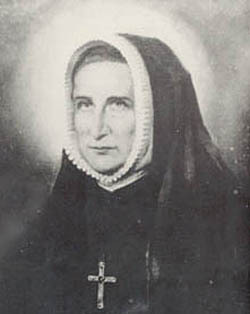 The large correspondence of Mother Philippine Duchesne with Mother Barat, other religious, family members and friends, as well as pertinent material from the archives of the Society of the Sacred Heart, was organized in a biography by Louis Callan, R.S.C.J., published by Newman Press in 1957. The quotes and information in this article was taken from an abridged version of that biography titled Philippine Duchesne: Frontier Missionary of the Sacred Heart 1769-1852, published in 1965. While the hardships of life might have resulted in a breakdown of discipline, Mother Duchesne insisted that the Rule and customs of the new convent be faithfully followed. When Bishop DuBourg requested certain relaxations to accommodate the more easygoing American spirit, Mother Duchesne firmly refused. Above, St. Ferdinand's Convent, built in 1819 under the supervision of Mother Duchesne. 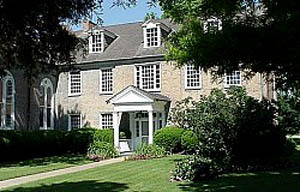 This convent became the first Mother House of the Ladies of the Sacred Heart outside of France; the site of the first Catholic school for Indian girls in the United States; the first free school for girls west of the Mississippi; and the first novitiate for women in the upper Louisiana Purchase Territory. Below, Old St. Ferdinand's Church,the oldest Catholic church building between the Mississippi River and the Rocky Mountains. 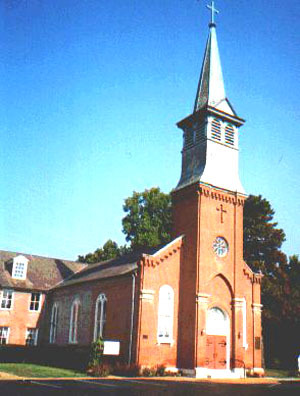 St. Ferdinand's served as the focal point of the Catholic Indian Mission movement, begun by Father De la Croix in 1820. Father DeSmet was ordained at St. Ferdinand's in 1827. During the next years the congregation made a slow but steady progress. As American born girls joined the growing band of sisters, Mother Duchesne opened four convents and two schools in west central Louisiana. Supported by the prosperous French-speaking plantation owners, these schools saw a success that Mother Duchesne would never personally experience in her own impoverished foundations in Missouri. Finally an orphanage, academy and free school were begun in the original destination, St. Louis, Mo., and in 1828, the Sisters returned to St. Charles to cheers and applause of the townspeople. Mainly because of her perseverance and organization skills, twelve Sacred Heart schools had opened in the New World by 1850. But Mother Duchesne felt herself a failure: she met no success with the few Indian free schools for girls she tried to establish. Because she could not learn English, she could not teach the American girls or interact with their parents. “Americans only admire those who have good looks and speak their language,” she would explain, and then tell how she was lacking in both regards. The gracious charms and formal manners of the French Old Regime, which she never changed, left her out of touch with the more egalitarian and relaxed American way of life. She brought this European formality and ceremony to the lives of the young ladies she influenced, a culture and refinement that would be a signal mark of the alumni of the Sacred Heart up until the 1960s, when the schools suffered the effects of the Cultural Revolution that entered the religious orders and Church with Vatican II. For 22 years, Mother Duchesne was forced to bear the heavy yoke of directing those who seemed to not want her directorship. Some Sisters also resented her formal ways and insistence on Rule, although all admired her spirit of prayer and sacrifice. At council meetings, she found it difficult to make her opinion prevail, since the common issue of her enterprises was failure, while the New Orleans foundations always met with success. In 1834, at age 65, Mother Duchesne retired to Florissant, the “poorest and humblest house of the congregation.” Still burdened with the administrative functions of governing the growing congregation in the United States, she nonetheless considered herself of no practical use. Finally, in 1840, she was permitted to resign as Superior of the American Mission. Her life became more and more the hidden work of prayer, suffering and providing whatever small service she could perform for her community and the Jesuit missionary priests who were carrying out the work of converting her beloved Indians. “All desire but that of doing God’s holy will has been extinguished in me,” she wrote to Mother Barat. As soon as the Belgium missionary Jesuits arrived in Florissant, MO, in 1823, Mother Duchesne became their enthusiastic supporter and friend. Even though her own foundations were always in dire need of money and goods, she found a way to provide small gifts of money, altar linens and clothing to aid the missionary work. In turn, the priests considered her a vital partner in their missionary ventures because of her constant prayer and many acts of mortification she offered for their work. 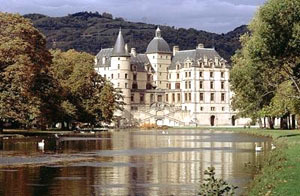 In 1840, Fr. De Smet asked the Assistant General of the Society of the Sacred Heart for some nuns to open a school among the Potawatomis at Sugar Creek in present day Kansas. Although ill and weakened by a life of hardship, penances and privation, Mother Duchesne, age 72, requested permission to join the colony. A final time, Mother Barat acquiesced against all good sense to the indomitable Rose Philippine Duchesne. In July 1841 the group arrived in Sugar Creek where they were warmly received by the Indians - who offered them gifts of human scalps. Having never mastered any Indian language, Mother Duchesne could not teach; her infirmities rendered her incapable of the hard mission work. Instead, she spent her time in prayer and small acts of charity. The Indians loved and respected the “Woman-who-prays-always,” the name they gave her. She spent fours hours in the morning and four in the afternoon motionless before the tabernacle, a spectacle that amazed the Indians and won their love and veneration. One night when she was making an all night vigil, an Indian crept up and left some kernels of corn on the hem of her habit to see if she really remained in prayer motionless for those long hours. He returned the next morning and found the grain in the same place. Her health continued to weaken under the hardships of life at Sugar Creek. Finally, after only one short year in the Indian mission, to her great disappointment, she was forced to return under obedience to Florissant, where she spent the last ten years of her life in poverty, mortifications, suffering and prayer. “I feel that I am a worn-out instrument, a useless walking stick that is fit only to be hidden in a dark corner,” she wrote about these times. 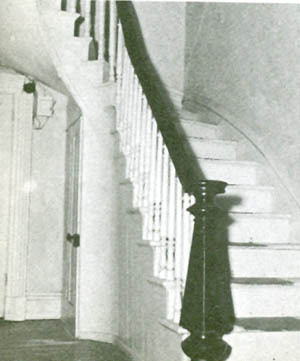 For her sleeping room in the Florissant Convent, she chose a narrow closet beneath a staircase. Visitors today to the Convent can still see that narrow sleeping place, a testimony to the humility and mortification of a great woman who held herself as nothing in eyes of the world. In fact, Mother Duchesne was much more highly esteemed and venerated than she imagined. She was almost transfigured by Holy Communion. A wonderful light was seen to shine from her countenance after she had received, as if a flame were reflected on her face. The children used to wait to reverently watch her come out of the chapel after her thanksgiving. “Never did I leave her without the feeling that I had been conversing with a saint,” Fr. De Smet, SJ, repeated in a letter of October 9, 1872. On November 18, 1852, the heroic life of Philippine Duchesne came to an end. She had kept the fast and early that morning, made her confession, received Communion and received Extreme Unction. She was sinking rapidly, but when she heard the invocation, “Jesus, Mary, Joseph,” she was able to answer, “I give you my heart, my soul, and my life – oh, yes, my life, generously.” These were her last words. 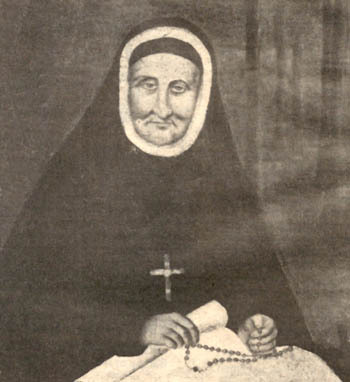 When Mother Rose Philippine Duchesne died at age 83 in St. Charles, Mo., Fr. De Smet wrote her religious Sisters: “No greater saint ever died in Missouri or perhaps in the whole Union.” He urged them to write a biography, but it was not done. The apostle of the Sacred Heart who came to America to work and save the souls of Indians was put aside in death, just as she was in life. Forty-three years after her death in 1852, Philippine‘s cause was officially opened at the Vatican and Pope Pius X declared her “Venerable.” On May 12, 1940, she was beatified by Pope Pius XII, and canonized 44 years later on July 3, 1988. What is the message for us, Americans, that Divine Providence provided by the example of the heroic life of Mother Philippine Duchesne? “He said she had climbed all the rungs of the ladder of sanctity, and never had he seen a soul more ardent in love for Our Lord. In his opinion, she rivaled St. Teresa. "Never had he known a person who was poorer in all that concerned her private life, and in this she imitated St. Francis of Assisi. Nor a more apostolic soul, eager for the salvation of souls, and he thought St. Francis Xavier had shared with her his zeal for the conversion of the infidels. In my opinion, her life represented the opposite of the American way of life and points to the direction we should follow to redress our faults. Her life was, as she defined it, a sequence of failures. The first order she entered closed; she did not feel realized in the second institution until she came to America to convert the Indians. Then, instead of carrying out this long-desired mission, she was ordered to teach girls and found convents. The work was more difficult because she never learned to speak English. She founded one convent that failed, then another that foundered. The girls there were ungrateful and worldly, and the Sisters chaffed under her governance and wanted to relax the Rule. When she finally was permitted to go to work in an Indian mission, she was already 72-years-old, too old to work or learn the native language. But after only one year, she was denied even that great consolation - she was ordered to leave the Indian mission and return to Florissant. She died there, without having accomplished what she felt called to do. This constant failures of her planned enterprises and a success only on the spiritual level is, in my opinion, a lesson for Americans. Often we only value the immediate success, the practical way of doing things, and a good appearance in the results. The life of Mother Duchesne is a call for us to abandon this way of being that idolizes appearances and success. It is a call to follow the will of God when we experience incomprehension, darkness, and failure. If we will turn our eyes to the path of the Cross of Our Lord and walk on it with courage and confidence, we will transform our mentality, our country, and our people into an elect nation called to help build the Reign of Mary.